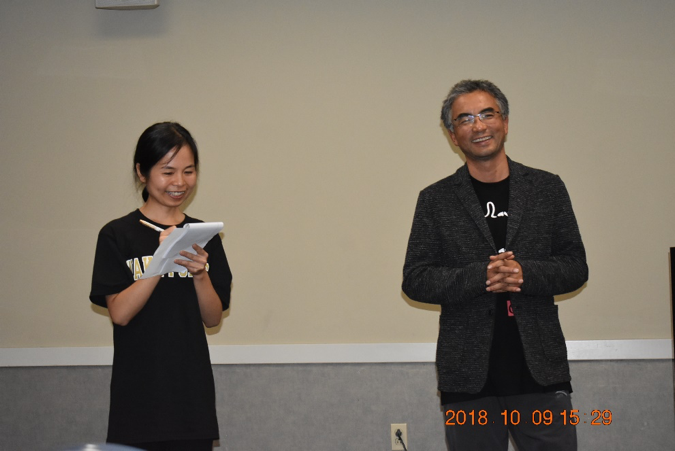 On Oct 9th and 11th, graduate students from the Interpreting and Translation Studies Master’s program (ITS) traveled to University of South Carolina Upstate Campus (USCU) at Spartanburg and Presbyterian College (PC) at Clinton, South Carolina to interpret for Mr. Pema Tseden. Mr. Pema Tsedan is a 13-time award winning Tibetan film director and screenwriter who just won The Best Screenplay at 75th Venice International Film Festival (Horizon) early September, 2018. Pema Tseden is also the first director to use a full Tibetan cast and feature the Tibetan language in his films. The Screening and Meet with Pema event at both USCU and PC included a film screening and followed by Q&A with the director in which Mr. Tseden fielded questions from audience members. The Wake Forest students interpreted between Mandarin Chinese and English. Harriet Fisher, one of the ITS interpreters, recalls that “the Q&A sessions also served as cultural exchanges. Pema Tseden spoke at great length about the particulars of Tibetan Buddhism, including reincarnation, karma, and the specific reincarnation process for the ‘Living Buddha’”. 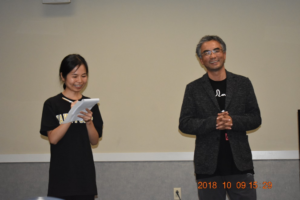 ITS graduate students Yuanyuan Zhang (left) and Harriet Fisher (right) interpret for Mr. Pema Tseden at Presbyterian College on Oct 11th, 2018. For ITS interpreters, the hours spent interpreting will count towards the 60-hour internship portion of the Interpreting and Translation graduate program. The internships gives the students the opportunity to apply the skills learned in their classes to practical scenarios. Established in 2011, the ITS program has grown into one of the most important of its kind on the East Coast. Adding the Chinese Track in 2015, ITS interpreters have attracted a tremendous amount of coverage from mainstream Chinese media such as the World Journal and The China Press.